Do You Know The 5 Reasons Why You Should Never Use A Backup Plan? If you’re selling your business or starting one, toss your backup plan. Words to the wise, toss your backup plan. Wait a minute, you say, what about all the conventional wisdom and so-called experts who insist on ‘Plan B’? The so-called experts and conventional wisdom are wrong. As usual. So are your well-intentioned family and friends who call you crazy for not having a backup plan. I should know. I was that kid right who started his EdTech right out of school with no money, experience, or team. The truth is, I had no business being in business. Thirteen years later I was an ‘overnight success’ with my 9-figure exit. What was the secret to my success? Since I didn’t have a backup plan, failure was not an option. Now don’t get me wrong. I failed at my EdTech every day. Many times a day. My failures were the marketplace talking to me. I listened by quitting to win. I quit activities that didn’t work so I could free myself up to find ones that did work. Five strategies helped me achieve my 9-figure exit. When I launched my next company after my exit, my ego had me forget these five strategies. My next company shot up to 7-figures. But it was 7-figures of losses. What are the five things that had me win big? Selling your business? Get ready for the journey of a lifetime. If you’re serious about either option, know this and know this well. Your backup plan will back you out of success. Building and sustaining a successful business is one of the toughest things you’ll do. Focus, grit, obsession, and passion are a few of the main ingredients you’ll need to win. Solving a painful problem you’re passionate to solve, for many people, is hard work. Crack the code on solving a painful problem for many people, and you’ll unlock your sweet success. Yes, success is sweet but fickle. Forget Hollywood and the movies that have you believe success comes easy. Every successful entrepreneur has endured challenges, hard times, and gut-wrenching situations. Imagine that you have a raging fire that you drench with a large amount of water. What happens? The water conquers the fire and puts it out. In this analogy, the raging fire is your determination to succeed, and the water is your back up plan. Your backup plan backs you out of success by creating a mindset within you that chooses failure. The stress you feel when you’re either selling or building your company is like none other. When leveraged in the right way, stress can be the factor to take you over the top. Stress is the trigger that gives you an excuse to quit and go to your backup plan. The irony is that stress often comes from business blind spots. Uncover business blind spots, and you uncover the path to your success. When it comes to success, there is no shortcut. The price of admission is to put in the time, take your lumps, and work as you’ve never worked before. Entrepreneurs that win, prepare in advance how to deal with stressful situations. 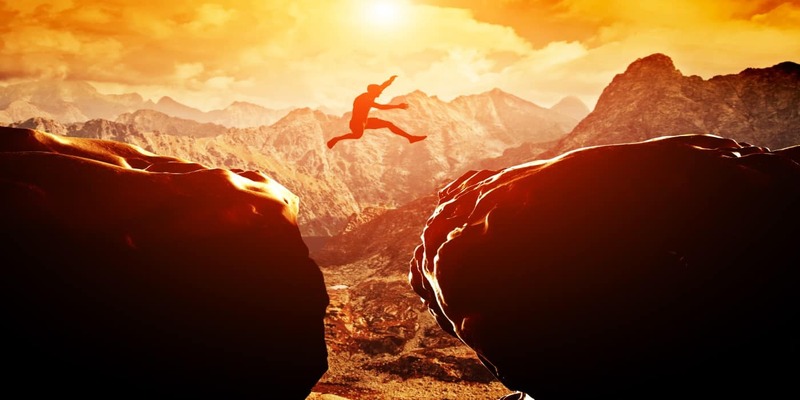 A common myth about entrepreneurs is that they are risk takers and even reckless. Not having a backup plan plays into this myth. The reality is that most entrepreneurs are risk-averse. Successful entrepreneurs think of everything that could go wrong and prepare. Successful entrepreneurs both welcome and expect stress because they prepare. Interested to know the two things you must do that will give you the keys to the castle? First, and most important, toss your backup plan. Second, plan your work and work your plan. What often separates entrepreneurs who ‘make it’ from the ones that don’t is an internal hunger. Hunger to succeed is the driving force that has entrepreneurs come back day after day. A backup plan is like throwing a big bucket of water on a flame. In the early days of my EdTech I was living in my parents’ attic and struggling. Failure and loneliness were the two things I could count on every day. I had a call from my MBA professor who offered me a high short-term consulting gig that paid well. Everyone around me that I was crazy for turning down a high paying opportunity. In reality, I said ‘no’ to a distraction that would rob me of my hunger to grow my EdTech. The second story happened after my 9-figure exit. I now had the money, experience, and team as a result of my EdTech. I became involved in a health care business. The business shot to 7-figures. Don’t get excited, it was 7-figures of losses. My backup plan was the money from the sale of my EdTech that was sitting in my bank account. On paper, the healthcare company should have been a stellar success. My lack of hunger from my backup plan ensured the healthcare company was a miserable loss. A backup plan robs your hunger for success. A backup plan prepares you to fail. The only difference between success and failure is your mindset. Knowing you have a ‘way out’ gives you permission to bail. And if you’re like most people, you’ll quit at the wrong time. When I launched my EdTech, most of my competitors laughed. Remember, I had no money, experience, or team. The laughter turned into rage when my EdTech began to win the deals. With their lavish expense accounts, my competitor’s salespeople play their part. And the industry ate it all up. How did I win the deals? I had no backup plan. Losing a deal to me meant I lost my company. My competitors knew their companies would survive with or without the deal. The backup plan gave a false sense of security. Without a Plan B, it was a do-or-die situation. All day. Every day. Without hesitation, I flew to the west coast for lunch with a prospective client. After lunch, I rushed back to the airport to catch my flight back to the east coast. Fourteen hours of travel for a ninety-minute lunch. And I did this again, and again, and again. Without a backup plan my hunger to survive, and win, propelled me forward. No exceptions. A backup plan is the best tool to prepare you for losing instead of winning. Resourcefulness Trumps Resources. All Day. Every Day. When it comes to success, I’ve saved the best for last. Whether you’re selling or building your company, remember that resourcefulness trumps resources. All day. Every day. Your backup plan zaps you from the focus required to become resourceful. If you know you have a way out, why become resourceful to find a way to keep you in the game? Resourcefulness kept me in the game when I struggled to find a way to make my EdTech work. My resourcefulness helped me develop new best practices that skyrocketed profits. Knowing that I had no backup plan forced me to get resourceful to find the way when there appeared to be no way. Winners quit all the time. The difference between winners and losers is that winners know what to quit and when to quit it. When it came time to exit my company, not having a backup plan kept me focused on making the existing plan work. My backup plan when exiting my company would have been an easy one: keep running my EdTech. But doing what’s right is often not easy. A backup plan would rob me of resourcefulness and the drive to get the deal across the finish line. Not having a backup plan was instrumental in helping me achieve my 9-figure exit. The smart money is on tossing your backup plan. May you go forth and prosper without a backup plan. Whether you’re exiting or building your company, know this and know this well. Having a backup plan is a shortcut to failure. Say goodbye to your backup plan and say hello to success with your new found grit to achieve your goal. Success at the best of times is both elusive and challenging. A backup plan is like dumping a swimming pool full of water on a candle. The so-called experts and conventional wisdom will tell you to have a backup plan. No matter what. A backup plan robs you of your hunger, desire, drive, grit, and resourcefulness to win the day. I went from the kid who started his company right out of school with no money, experience, or team to a 9-figure exit. My ‘overnight’ success was thirteen years in the making. While there are many ingredients to success, I’m often asked what’s my success secret? Not having a backup plan is not a license to be reckless and a gambler. Quite the opposite. Without a backup plan, you’ll think about everything that can go wrong and prepare for it. When the stress takes over, you’ll stay in the game when your instinct tells you to bolt because you have no Plan B. Saying goodbye to a backup plan allows you to say hello achieving your dreams and goals. And the great news is that you have everything you need to be successful. Right now.